For a quick hair fix this season, go with the Hairdo French Braid Band. This braid band is designed to fully accessorize your look in just one effortless step. 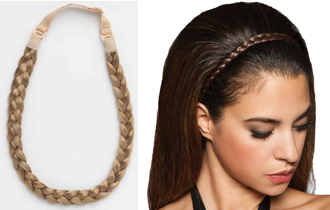 Simply slide on the braid band to best match your hair color. It makes the ultimate statement with a minimum investment (Ulta and Ulta.com; $10). Repair and protect with KORRES Mandarin Lip Butter Sticks. They are a deeply nourishing lip treatment formulated with a luxurious blend of softening oils, butters, and waxes. Mandarin oil refreshes and soothes dry, chapped lips while rich shea butter and sunflower waxes deeply nourish for long-lasting care and comfort. Available in four tints, all of which can be worn alone or layered under a lipstick or lip gloss ($16.50; Sephora.com). For dry skin and hands, reach for Lavanila Laboratories The Healthy Body Butter in Pure Vanilla. This super soft, all-natural body butter absorbs instantly for deeply hydrated, luxuriously soft skin. 100 percent pure shea and cocoa butters blend with powerful antioxidants and essential oils for long-lasting hydration. Super soft scents and a non-greasy formula create the ultimate indulgence ($19; Lavanila.com).